Taking a secret meeting in the woods by the broken down cabin, Rick, Carol, and Daryl discuss their plans to test the people of Alexandria and to potentially take back some of their weapons. A walker walks up and Carol empties her clip on it. As they are about to walk away, they notice that one of the dead walkers has a “W” carved in its forehead. Rick returns to Michonne in the station and discusses his apprehensions about handing over so much power to him and the rest. Deanna calls some of the group together and lays out her plan for the future. 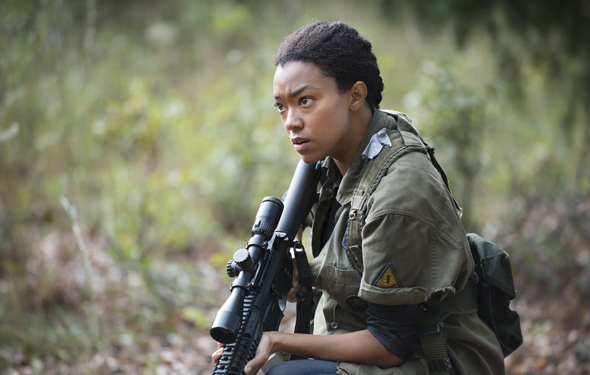 She states that Rick and Michonne are her hope for security and Maggie can be her hope for their future government. Sasha volunteers herself to serve in the tower, but Deanna initially refuses to staff it. Sasha attempts to persuade Deanna, but she chooses to send Spencer instead. She demands that the group come to her house for a get-together. Carol catches up with Rick while on patrol and they put together their plans for the night. Back in the woods, Daryl is startled by a rustling in the woods. Aaron admits that he was following but is impressed with Daryl’s ability to distinguish between friend and foe. Daryl allows him to continue to follow on his hunt. They come across a wild horse and Daryl slowly walks up to it. Just when they got up close, they are interrupted by walkers, causing the horse to run off. Aaron tries to talk to Daryl about feeling like an outsider. He says that fear is what separates them from the rest. Catching up again to the horse, they are ambushed again, with Aaron having a close call with a walker hiding in the tall grass. After defending themselves, they find the horse has been captured and lost the fight. Daryl and Aaron take out all of the walkers around the horse, leaving Aaron to put it down. Carol and Olivia chat for a bit about cooking, but two of the guys walk in and talk about needing to go check the perimeter. Carol is able to unlatch the window while no one is looking. She heads off to the party with Rick and Carl. Greeted by Deanna, she guides them into the crowd. Abraham and Rosita enter and feel uneasy about their surroundings. Rick meets Reggie, who praises Rick for his efforts beyond the wall. Maggie and Glenn catch up with Noah, who appears out of place. He wants to bail, but they convince him to stick around. Rick gets a chance to meet Jessie’s husband, who introduces himself as a doctor. Jessie then comments on how they are getting to experience life somewhat like before the fall. Rick spots Carl hanging out with other boys and smiles. Daryl watches from outside the house and starts to walk back to his house. Aaron catches him and asks him to join him and Eric for dinner. Daryl slurps up his pasta as Eric blathers on about getting a pasta maker. Aaron’s secret was finally revealed to Daryl when they go into the garage and discover his collection of bike parts. Aaron asks Daryl to become Alexandria’s other recruiter, acknowledging his ability ti distinguish between a good and bad person. Daryl accepts the offer and offers to get Aaron some rabbits. Sasha shows up to the party late and meets Spencer. She walks off quickly. Abraham finds Michonne outside and catches up about this new lifestyle. Jessie rejoins Rick while holding Judith. Rick kisses her on the cheek and takes back Judith. Sasha listens around to all of the talking and starts to have a nervous breakdown. She is approached by one of the women about cooking her a meal and she explodes about what the woman spends her time worrying about. Carol sneaks into the pantry to steal some guns, but she is followed by Sam. He admits that he was hoping for her to make him more cookies. She tells him that she will, but he has to keep it a secret. He admits that he cannot keep it from his mom, so Carol scares him into it. The next morning, Deanna finds Sasha out by the gate. Sasha still doubts the realness of the community and walks out of the gate. Out in the woods, Rick, Carol, and Daryl meet about the guns she took. Daryl admits that he does not need one, but Rick takes one. Back at there house, Michonne puts her sword up on the wall. The trio reenters the community, and Rick sees Jessie and her husband walking by. Attracted to the wall, he goes over and senses the walker on the other side. Reaction: This was a slower moving episode, with fewer major reveals and just more tension building over the potential finale blockbuster event. Don’t be mistaken though…there were some developments. 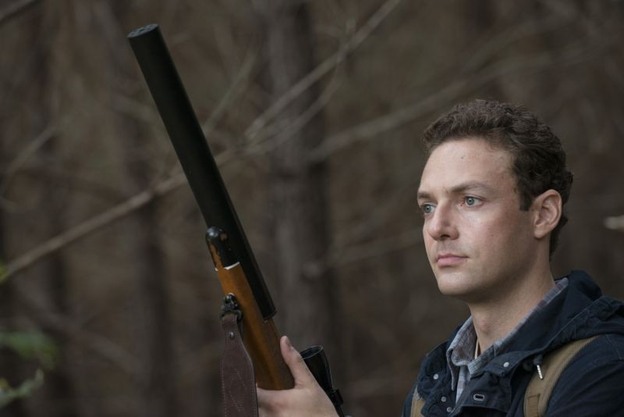 Daryl has been a wild animal for so long and has felt like an outcast for so long that Aaron has become a possible connection back into the somewhat more civilized world. He can at least be an outlet for more friends than the family created with Rick and the others. After inviting him to dinner and unveiling the motorcycle build, Daryl has bought into the idea of Alexandria. Sasha is not doing so well, in comparison. She has been dealing with PTSD or something like it. She freaked out when she was shooting the pictures at the start of the episode and exploded at the woman at the dinner party for worrying about something Sasha felt was meaningless. She looks to be in some real trouble with making good judgment calls, but she has also become the sharpshooter of the group and is filling a void that Andrea would have been had the show followed the comics. Carol’s moment of fear-mongering was intense and awesome. While she has been playing a role since arriving at Alexandria, the scene with Sam allowed her to break back into her fierce persona and save her commitment to survival. Rick has been struggling through this transition. He does not trust the people of Alexandria and now seems to have more questions brewing with each move. He has Jessie starting to pull at his attention. Carl seems to be integrating for the moment, but he was just concerned about getting soft in the previous episode. Deanna has put a lot of trust in him, but Rick can sense that the community is not perfect. He is feeling like he is still a fish out of water and that his group is starting to separate. The question remains whether Rick will push the boundaries and go savage again…I believe it is coming. It has been revealed that there is going to be an epic conclusion to the season, and I, for one, cannot wait to see what it is. 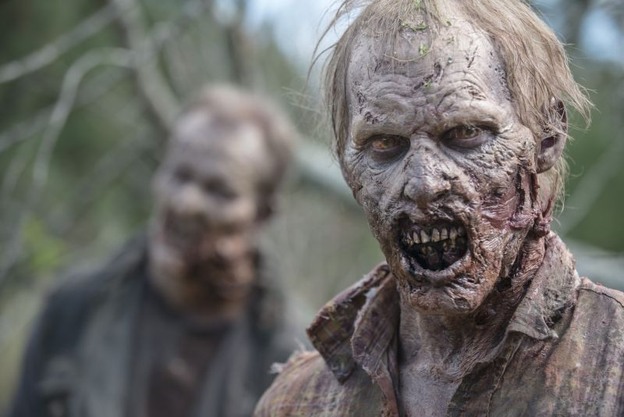 Either the community is going to succumb to a major walker attack, a new threat is going to unveil itself, one of Rick’s group is going to make a major mistake, or a major cast member is going to be killed.